Inazuma Eleven Strikers will launch across Europe on September 28th, and Nintendo have today provided further details on the Wii exclusive. Players can build their dream team of star players, and enjoy arcade-style action alongside up to four players. 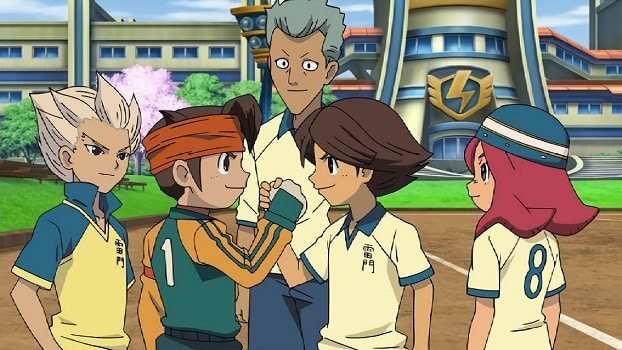 You’ll take part in a series of competitions, tracing Raimon Jr High’s football team as they rise through the ranks – playing through team encounters that take place during the TV series. New players can be scouted from any team you defeat, although this will cost you Inazuma Points, with over 150 characters from the series appearing each with their own strengths, bonding as they play together to improve their skills even further. You can pull off powerful Co-op Moves, as well as impressive Special Moves to stop your opponent in their tracks or shoot for goal. Up to four friends can join in local multiplayer, playing as a team or challenging each other in single matches or tournaments in 2 vs 2 or 1 vs 3 teams. Here, a second player can even take on different supporting roles by acting as a Coach or a Manager. Inazuma Eleven Strikers will be available for Wii across Europe on September 28th.